I have issues. I have hang-ups. I struggle in this role I’m in. I don’t think anyone ever said parenting would be easy. In fact, I think I repeatedly heard how this will be the toughest thing I’ve ever done. But there IS a real problem with parents nowadays. To circumcise or not to circumcise? To co-sleep or not to co-sleep? Television or no television? Homemade baby food or store bought? Disposable or cloth diapers? Stay-at-home mom or working mom? Daycare or nanny? Homeschool or public school? There are endless articles, scientific studies, news reports, and blog posts to counter the decisions a parent makes. It seems as if every parental choice faces some form of public critique. It’s overwhelming and discouraging. My children, just like anyone else’s, misbehave in public places. I will immediately reprimand them and redirect their behaviour. Yet, I cringe when this happens. I look over my shoulder and wonder what other people are thinking. Is someone watching all of this? Is someone recording it? Will I encounter a rant on the internet tomorrow morning because some know-it-all wrote an epic dissertation on how parents need to be firmer/more lenient with their children? If your child does something stupid, you’re shamed. If your child gets hurt while in your care, you’re shamed. Anyone who knows me or my blog knows that I do not profess that I know it all… especially when it comes to parenting. I share my honest journey of trying to become the mom I want to be. Yet, when I share my shortfalls, I get berated. Like when I confessed that I want to stop yelling at my kids, I got bullied by an individual who said I was a bad mom for yelling and that I needed to stop immediately. Naturally, I shared his sentiments that I needed to cease yelling (hence the fact that I wrote the article in the first place), but the guilt trip, belittling, and shaming was completely unnecessary. The real problem with parents nowadays. Over the past few weeks, I have witnessed the online badgering of the parent. From the gorilla mom to the poor parents whose son lost his life to an alligator… I have seen cruel, hateful, and disgusting responses. It sickens me because I see these situations, and I think that it could have easily been me. I mean, just a couple months ago I shared how I made two huge parenting mistakes and both nearly cost my daughter her life. Worse yet, these parenting mess-ups happened within a 36-hour time span! The amount of grief and guilt I felt over these situations weighed heavily on me. If either scenario ended in serious injury or death, I don’t know how I would cope. But I can tell you something… getting berated and criticized would be devastating. All of these events helped me come to a conclusion… the real problem with parents nowadays is the people who judge and condemn them. Frankly, I’m sick of the judgmental, “perfect” brood who sit behind the safety of their computers and cast blame. How dare they be so self-righteous?! They don’t have children. They have never had children, so they don’t know what it’s like. They have no inkling of what sleep deprivation does to a parent. They have no idea about the struggle to decide on what to do and how to do it. They don’t know what it feels like to be torn between the need to protect and the need to let our children have a bit of independence. They are unhappy. This group of nasty commenters are miserable people who would say something negative about anything. They spew hateful things because they, themselves lack love and joy. They think they’re perfect. Yes, sometimes the cruel articles and comments come from individuals who are under the delusion that they are perfect. Spoiler alert! You’re not! No one’s perfect. They are clueless. They have no idea what they’re saying and they “speak” quickly before thinking things through. One of my favourite quotes which I discovered in my early childhood career was: “It takes a village to raise a child.” The village is dynamic. Diverse. Supporting. Loving. Caring. Understanding. However, if this online bombardment of parents is what the modern day “village” looks like, I want nothing of it. When I screw up, I face enough burden and heartbreak without the social media world pouncing all over it. When my guilt and shame are heavy, I need compassion. I need empathy. I need light in my time of darkness. I need someone to say that we all make mistakes. To me, that’s the village that I want to be part of. That’s the world I want to live in. So as I pour out my heart here, I want you to consider something… every word you speak carries great weight and responsibility. Whether the words come from your fingertips or your mouth, you are accountable for what you say. Sometimes we need to share an opinion that’s contrary to what’s popular or common, but if your words are erring on the side of judgment, hate, or condemnation, I encourage you to pause and reconsider. Speak truth but also speak with kindness, love, and respect. I can promise that if you speak the truth with love, it has far more impact than words spoken with hate. Just because the words are sent out from behind a screen, doesn’t mean they have less weight… they are just as powerful. I urge you to use that power to do good. I can’t believe how many people just say/write whatever they want without really considering the weight and implications of their words! It’s disheartening. I hope this trend of nastiness goes away soon… it sickens me. Thanks for sharing your thoughts on this Janine! Wishing you a lovely week as well. Jennifer, I can’t begin to say how much I love this post. It truly hurts when someone judges my parenting skills so I try not to judge others. As far as those parents, they’re already going through their own guilt and don’t need anyone else adding more onto them. I’m not perfect and nor do I profess to be. We’re all humans and we all make mistakes and if you’re going to be bringing up my mistakes all the time, that doesn’t make me feel better about my shortcomings. Sometimes we need to put ourselves in each other’s shoes and think before we open our mouths to speak. We’re all doing the best that we can. Yes! We’re doing the best we can and when our best falls short, others need to have compassion instead of condemnation. This has been bugging me so much lately Amanda. I’m truly frustrated with society’s treatment of the parent. I’m delighted you enjoyed this and that it resonated with you Samantha. I can’t stand what’s happening online lately. The bullying that goes on between grown adults disgusts me. It’s disheartening. I pray people slow down and think before they respond. Thanks for sharing your thoughts (and experiences) on this matter. Thank you for saying this! I am the mother of nine children. I’ve seen *a lot* (lol). But I never rush to assume or judge bc (gulp!) I mess up all.the.time. Thank you for sharing that Heather! I mess up all the time too – more grace and compassion needs to be extended to parents. This is a tough journey! Yes! Your exhortation makes me think of so many scriptures . . . Proverbs 18:21 says that life and death are in the power of the tongue. You’ve expressed that truth well here. May we all be quick to hear and slow to speak (from James 1:19) that our words both public and private would always be those which promote life. And 1 Corinthians 10:12, if we think we “stand” let us pay attention lest we fall . . . not one of us is without fault or ability to sin or safe from tragedy. So much better if we all look best to our own ways rather than attempt to pass judgement on the lives of others. ” . . . every word you speak carries great weight and responsibility. Whether the words come from your fingertips or your mouth, you are accountable for what you say.” AMEN to that! I wish people would remember – and care – just how hurtful their words can be. Yes! 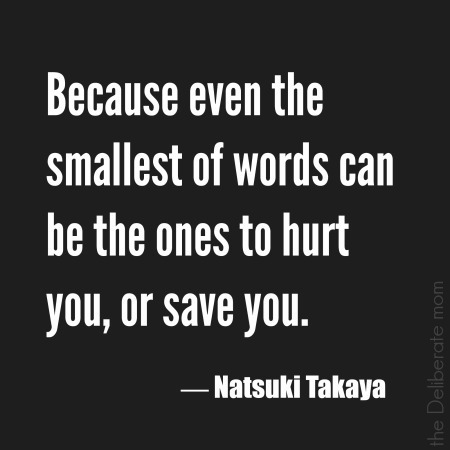 There is such power behind words. Just as quickly as they can build up, they can swiftly tear down. I would love to see more building up…. It’s strange how social media has made many of us.. antisocial. We’d never be like this in person, would we? Or is this where it starts? This is a beautiful post, and it IS the problem with parents nowadays. I’ve so learned not to give advice when it’s not asked, because I know how it makes me feel. I would be truly disheartened if everyone who behaved this way on social media acted similarly in person. I think this generation has it tougher than any other because everything they do is dissected, put on display, commented on, and critiqued. Thanks for sharing your thoughts on this as well Tamara. This couldn’t be more true Jennifer. As much as I love social media I hate it for how cruel people can be. You are spot on with your descriptions of people who feel like they need to be cruel and hurtful. Thank you for sharing this! I wonder how many of these people would really carry on like that if addressing someone in person. It’s so upsetting. I don’t get how people can say such polluted things about the parents featured in the news when they obviously only know parts of the story. If only more people would take a step back and consider the other perspective before making such brutal statements. I’m delighted this resonated with you Katie. I hope people change for the better. This way of behaving and interacting with one another is so discouraging. Parenting is tough enough without having it critiqued by everyone around you. Yes it takes a village to raise a child. Here in my home land usually people correct your child even in your absence. They look out for other people’s kids especially in neighbourhoods. I think it is a culture thing over here…although things are gradually changing.? For instance, you are a new mother, your home is usually flooded with house guests, Gifts, Food and lots of helping hands…practically, you do nothing as a new mom save nurse your baby. Everyone wants to help not judge you? Thank you for shedding more light on this very important issue. “The real problem with parents nowadays is the people who judge and condemn them.” Amen, Amen and AMEN! I loved this. Why is it so hard to be nice these days? Especially online. It seems like it is not the norm and I worry that we have gotten that way. What can we expect moving forward? “I urge you to use that power to do good” Now that is a movement I can totally back! Pinned! Great post! Everything you say is so true. I especially love the four categories of people who are so quick to cast judgment on others parenting skill, I think its spot on. Well said, Jennifer. I’m reminded of an old Christian saying: “there but for the grace of God go I”. It’s easy to stand in judgement when we forget that without God’s grace we would make the same mistakes or even worse. I too want to be a part of a supportive, community that’s full of grace. I know that the world does not always provide this so I continue to look for and cherish it when I find it. I also hope to be one who speaks (and types) words of comfort and hope to others. Let’s be that voice together! Let’s make a difference one comment at a time. Hugs and grace to you! Beautifully written. As much as I have been frustrated (like you) the pitchfork wielding parents of the internet, I have been equally encouraged by people, like you, who have spoken out in favor of love and respect. I especially like that you allow that there are times when we need to express an unpopular opinion, however, it MUST be done in a spirit of love and respect, not judgement or hate. Thanks for adding your voice to the chorus. It really is a different age we live in. Now anyone and everyone can say things they would never dare to say to a person’s face. It’s almost made me want to get off social media at times. Our words are so powerful. I am going to say this about parenting. A lot of parents either don’t care or make it too complex. It is that extreme. But the worst are the parents who are trying to be “cool” or “friends” with their kids. I have two kids ages (basically) 19 and 20. They both go to college and have never been in trouble. I basically raised myself since I was six, so I had no role models in that regard but I believed that if I gave my kids, some food, some water, some sun, teach them right from worng and lots of love then things would be ok. I teach in place where a lot of parents are dealing with their own issues either drugs, alcohol, etc. I grew up with that and they don’t care which is sad. I always thought if that creature had my genes, it was more important to get my stuff together to be there for the kids. Many don’t. On the other hand you have the ones that make it too complex (my ex). The organize everything for their kids, put them in all these activities run by adults. I used take my kids down to the park every Saturday and let them figure out stuff. There are too many people telling people what to do when it comes to parenting. I ignore the noise and do what I think is best. As I said the worst are the ones who are trying to be cool or friends with their kids. I have a bunch of friends like that. I told my two that I am your parent and that I if I have to be your friend then something is wrong with me. I don’t need to be hanging out with young adults on a regular basis. Oh Jennifer, this is so good! I couldn’t agree more. Sharing!!! Sometimes I won’t share the harder stuff online because I am not interested in being told all the things I did wrong or what I should do to make it up. Exactly! Who wants to hear how they’re “screwing up”?! It’s so frustrating that people think that they have a right to critique too. Ya I gave my three years a hard candy. I forgot he had it min his hand so when I put him in his car seat and drove off I didn’t think Anthony’s about it. In retrospect I even heard the choking noise but it didn’t register because I was trying to talk to my husband about something. I finally looked back and he was okay but his eyes were watering and he told me he swallowed the peppermint whole and it hurt really bad. I had the same reaction you did by the pool. This parenting thing really isn’t for the weak. Oh wow! That is so scary. Parenting is tough and usually, parents don’t need to be told what they should have/could have done. In most cases, we’ve replayed scenarios over and over enough times in our heads. Yes, yes, and yes! I’ve opted to drastically reduce my social media activity because of this behaviour. Being a parent is hard enough without all the unsupportive influencers. I’ve realized that I no longer prefer to publicly share my family’s life. I don’t need anyone “like” my photo or thought of the day. My self-worth is greater than that. And I am tired of seeing everyone’s carefully crafted perfect life. YES! I take periodic social media breaks because I can’t stand how negative it is. Oh and the “perfect lives”… most people don’t want to share pictures of normalcy or imperfection but you know what… sometimes that has greater impact! So many people are craving “real” – so many of us are sick of the “perfection”. Thanks for sharing your thoughts on this Ramona. Parenting is definitely not for the faint of heart. Everyday we have to make an abundance of choices for the welfare and happiness of our the littles in our care. Just following your blog I think any reasonable person could conclude that you are a fantastic mom. Open and honest. We all make the mistakes. I always think back to how my mom raised me and laugh at how if she was a mom now I probably wouldn’t have fallen off a bridge (it was a small one) and I wasn’t listening. I was being impatience and it was my own fault. My parents were more concerned that I was ok then what everyone else would say. I was about 7 at the time. Like anything in this world we learn from our mistakes and I know I have a lot more mistakes to make as parent as a person. Lets support and lift each other up. It is why we love your blog. Thank you so much for your kind and encouraging words. I hope that this message reaches far and wide… it would be wonderful if parents could support one another rather than bring each other down. Thanks for sharing your thoughts on this Bonnie! I agree Ashley. I imagine living in simpler times – when there wasn’t texting and social media.